Vaccinating young males and females against several types of human papillomavirus (HPV) could dramatically reduce the incidence of HPV-related cancers worldwide, according to Douglas Lowy, M.D., deputy director of the National Cancer Institute. 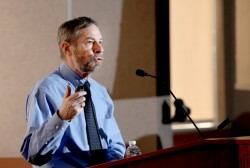 Lowy discussed the scientific underpinnings of the HPV virus and the vaccines designed to block the viral infection during a special lecture last week at the Vanderbilt-Ingram Cancer Center. VICC director Jennifer Pietenpol, Ph.D., welcomed Lowy and presented him with the Orrin Ingram Distinguished Lecture Award for his groundbreaking work in several areas of cancer research. Lowy and colleague John Schiller, Ph.D., from the NCI Laboratory of Cellular Oncology, are the scientists whose research led to the technology for HPV vaccines. As a result of this work, the two investigators received the Albert B. Sabin Gold Medal Award from the Sabin Vaccine Institute in 2011. In the developing world, approximately 90 percent of all cervical cancers are linked to strains of HPV, an infectious agent that is spread through sexual contact. Most HPV clears up on its own, but if the virus persists, it can lead to cancer. “The virus maintains itself in the basal cells and that is why it can be hard to get rid of it,” explained Lowy. Schiller and Lowy discovered that the outer layer of the HPV virus, called L1, could assemble into virus-like particles (VLPs) that are similar to the outer layer of the actual virus. Exposure to the VLPs causes the immune system to produce antibodies. It was this discovery that informed the science behind HPV vaccines. In addition to cervical cancer, HPV infection also causes genital warts and has now been linked to head and neck cancer, especially cancer of the throat and tonsils. Between 1988 and 2004, Lowy pointed out that there has been a threefold increase in HPV-positive cases of these forms of head and neck cancer. Two HPV vaccines, Gardasil and Cervarix, have been approved by the Food and Drug Administration. Gardasil is approved for males and females, while Cervarix has been approved for females. Lowy said the CDC currently recommends routine vaccinations for males ages 11 to 21 and females ages 11 to 26 for prevention of cervical cancer and/or genital warts. However, Lowy pointed out that patients in the United States have been slow to adopt the new vaccines, and some states, including Tennessee, have an especially low rate of HPV vaccinations. Several factors may have contributed, including concern about safety. But Lowy pointed out that follow-up studies revealed that HPV vaccines have the same safety profile as other vaccines. HPV vaccines are also shown to be highly effective against infection. Lowy said the vaccines work by preventing infection from specific types of HPV, but they do not alter the course of an existing infection. “This is why it is very important to vaccinate before they [young boys and girls] become infected,” said Lowy. Recent research may spur creation of second-generation HPV vaccines and Lowy explained that these could simplify vaccine production and provide broader protection against more HPV types. While widespread vaccination programs can be expensive, especially since current HPV vaccines require three injections, Lowy pointed out that vaccinating young boys and girls could eventually reduce cancer incidence and reduce expenditures for broad cancer-screening programs.